So, it’s the time of year for resolutions, goals, objectives, gaining a sense of what we would like to achieve in 2017. However, I’ve seen a lot of chatter on social media that suggests many are bucking the trend and not making any resolutions, hitting the new year with no particular plans to change the world or even change themselves. ‘Besides,’ the rhetoric goes, ‘what’s the point any resolutions will be reversed after the first few weeks, promises made to ourselves, no better than any promise from a politician.’ I even saw a humorous post that suggested someone was wanting to open a bar and gym, expecting the first few weeks of the year to be filled with enthusiastic Adonis want to be’s, and then after that, as we all settled for our out of breath fat, the gym would be transformed into a bar. Now there’s something I could get on board with! As 2017 rolls around and begins to take us on its whirlwind journey through time, I am acutely aware of my fragility, my weakness, my inability to do just about anything, including relationships, highlighted recently through a messy ending. Like a superhero stripped of their powers, I am left flailing in the face of any super villain that wants to come along. I had a conversation about this very thing several years ago. A friend and I were meeting at a café and talking about the fact we had both made it past 33, which meant that neither of us were the Messiah. As flippant as that sounds it was a staunch reminder to a workaholic activist with a Messiah complex that I indeed was not the saviour of the world, nor would I ever be. My sense of fragility was only heightened over Christmas as I spent time with Mum and Dad. To be fair it has been a hell of a year for them, both experiencing cancer, with Dad struggling to see and looking reminiscent of an emancipated prisoner of war and Mum reluctantly beginning to accept her role as carer. On returning to Melbourne, aware of their mortality and mine I found myself experiencing a few days of emotional exhaustion. Coming towards the end of that time I began to see something new. I’ve always seen admitting fragility as weakness and so have worked to suppress it, recently I’ve not been so successful. However, perhaps that is not a bad thing. Owning my fragility, letting the false superhero die has in fact allowed a new authenticity and humility to come to the surface. It’s true I can’t just pick up any project that comes along, I’m finding more and more if the project doesn’t line up with the truth revealed by this new authenticity and humility I have a very strong reaction against it. This points to a deeper level. Saying ‘no’ is not a sign of laziness or avoidance, but in fact an affirmation of identity, of who I am created to be, what I am created to do. The unique me. Even though fragility is awkward and uncomfortable, it’s part of being human and it seems part of being uniquely who we are meant to be. So this year, if there are any resolutions to be made, I’m not going to resurrect the superhero, instead I’m going to embrace my fragility and the identity it reveals. The buskers are out in full force, cascading the city in a mix of jazz, blues, rock and classic Christmas carols. Every few feet there is a new delight to behold from a group of human statues, standing perfectly still in their grey or gold, to a window display of the brightest colour and movement, a square filled with Christmas decorations and a fully dressed tree reaching far into the sky. The city is buzzing with a kind of nutty magic, as people rush from store to store looking for that special gift for Mum, Dad, Aunt Mary or Uncle Hubert. Some prefer to line up for one of the many attractions, waiting seemingly for hours, to quickly walk around a gallery of gingerbread or catch a glimpse of the red suited crusader. For others, the line itself is an attraction. This last week, the lead up to Christmas has been a strange one for me. I’ve been in slow motion, when others seem to have hit hyper drive. Two days after arriving home from New Zealand, I went in for day surgery to have some lose bone removed from my jaw, the result of a wisdom tooth extraction. This short procedure left me in recovery mode, but has also given me the unique gift of slowness. Initially this didn’t feel like a gift, as I struggled through the fog left by anesthetic, pain and analgesic, however as the fluffy white curtain began to part I saw a different quality in the world around me. 5 days till we remember and celebrate Christ’s birth. The reminder that he is with us, incarnate amongst us. He moved into the neighbourhood, he became flesh and blood. He identified with us, his creation. He took on our infirmities, our frailness, but also our beauty, our confusion, our everything. In the midst of the multi-cultural concrete jungle is His presence, his stamp, forever with us. He took on the reflection of his beauty in us. Lesser than his own beauty but a recognition and redemption of ours. We can see beauty in the green amongst the grey. Yet more beauty is revealed in the people around us. Perhaps a deeper more intricate beauty, one that is often hidden, yet has the potential for such healing and joy and freedom. Christ, intricately linked with his creation, perfecting his image in us. To see the hidden beauty in others is an exercise in slowness. Perhaps as I practice it I’ll get quicker, but I’m not sure that I want to. As you slow down and watch people the intricate acts of everyday kindness are breathtaking. The father making sure his young daughter doesn’t fall over on the tram; people making space for each other to eat lunch on a crowded bench at a café; a volunteer giving up their Christmas with family to make family with those who have none; the passion in the eyes of someone struggling with addiction as they recall stories of another time; the wonder in the eyes of a young child, that ends up consuming their whole body as they point out city decorations; the smile of a waitress, no doubt run off her feet, as she serves yet another coffee; kind words spoken in conversations with strangers; and the list goes on. Perhaps an even more difficult task is to recognize this same beauty in those we connect with, our nearest and dearest for whom in the hustle and bustle of the everyday can easily get taken for granted. The gift of slowness gives us the opportunity to watch, to notice the little things and if you are incredibly lucky, slowness will even allow you to lock eyes with a loved one and drink then deep into your very being. This pre-Christmas time has been a different one for me, not filled so much with the frenetic pace of preparation but a preparation has been happening none the less. One that I hope will bear more lasting fruit than many of our Christmas activities. Fruit that perhaps we all need, as the realities of radicalized disaffected young people comes closer to home. The incarnation which we celebrate at Christmas is a reminder of hidden beauty that has been revealed, not for its own sake, not in a pretentious ‘look at me’ way, but revealed to remind us of who we are created to be. It’s a beauty that can change the world. It is a beauty that must change the world. Suddenly by employing AI and ABCD someone in Steve’s position has the potential to be caught up in a process that perhaps for the first time encourages them to see themselves as a valued and needed member of a local community. For those of us who are reasonably functional we can take that perspective for granted, but for someone on the margins such as Steve, that realisation is profound, potentially life changing. Kretzman and McKnight outline a 5 step approach to classic ABCD. Many communities are picking up on the principle of working from a strengths approach but not necessarily employing all 5 steps. However for our purposes understanding the original methodology will help in its application. Step 1 – Asset Mapping: As described above the process of creating a register of skills and perspectives is instrumental in helping each person feel that they have a worthwhile contribution to make. A church with a robust Kingdom theology and appropriate orientation towards the world would be in a good position to facilitate such a process, in fact to be key in all 5 steps. As completion of the register nears the community can then ask the question what resources do we have to tackle the concerns in front of us. Step 3 – Economic Development and Information Sharing: Many parts of local communities are depressed economically, with people suffering from unemployment or under-employment. As people become aware of the skills they have, their ability to start micro enterprises increases, which in turn increases confidence and the negative cycle of poverty can begin to be turned around. Businesses, associations and institutions are also encouraged to as much as possible source what they need locally, helping to stimulate the local economy. This has many positive effects, including reducing greenhouse gas emission as goods are not being transported large distances into the community. Communication is also key to successful community building. When people lived in a village, the community hub was the well, everyday most people would need to go to the well, so it was not uncommon to see people sitting and talking discussing current issues. Today communication nodes are more complicated however the information flow needs to be tracked through local papers, community radio and the ‘grapevine.’ These are also avenues to actively promote new messages. In Pakenham there were a couple of key communication nodes, the publican at the bottom pub and the barber. I found the barbershop a fascinating phenomenon, the barber was fourth generation and the old men of the town would gather at the shop, sure for haircuts but I suspect more to have a chat and a catch up on what was happening in the town. So if we wanted to promote a project, I would often talk with him and if he came on board you knew the informal chain of communication would get worked. We were also regularly in the local papers, with the journalists beginning to chase us for stories at certain times of the year. Step 4 – Community Visioning: If we are working to see community regeneration, this step is vital. The community begins to come together around the creating of a shared identity, vision and values. Without this common thread the process of regeneration can stall and people can turn inwards and the possibility of a fuller community experience so necessary for human flourishing is diminished. It is important that everyone is invited to the planning table, especially the marginalised. These meetings are future focused and build on the foundation of AI allowing people to voice their aspirations. Typically in these sorts of meetings common themes are discovered which begin to set a course of action for the community. It is important to invite buy-in to this process and its outcomes so people are invested and willing to work together toward change. It is important that the change envisioned is grounded and not excessively future orientated as this allows people to enjoy early success and provides motivation for future endeavours. Step 5 – Leveraging Outside Resources: As a community develops there may be the need to enlist specialist services, which the community doesn’t have. It is essential that this is the last step in the process. Many communities look at what they are lacking and lament that ‘they should fix it.’ This attitude locks these communities in poverty as they wait for a magic handout. The community working through the ABCD process has become an empowered community and instead of expecting a handout to fix the community’s issues, they look to partner with the provider of the services they need. The nature of relationship with outside help is vastly different to that of a needy community putting out their hand. Another way of expressing ABCD is Asset Based Community Driven, it is essential that the work of regeneration is done by the community, not for it. This approach challenges the welfare models predominant in the social services. Many of these models have a biblical root, where we are told to feed the hungry, look after the poor and so on. Purely handing out goods and services is a misunderstanding of this biblical mandate. For the most part when the Bible talks about the alleviation of poverty it is so individuals and the community can participate socially and economically in the broader society. A key to ABCD and preparing people for involvement in this kind of enterprise is relationships. In poorer communities hope has quite often gone missing. There is very little belief that things can ever be any different, personally or for the community. As relationships are developed and trust grows there is the opportunity to feed in an alternate message. Kretzman and McKnight, Building Communities from the Inside Out, 346. Van Eymeren, “Building Communities of the Kingdom,” 68. Kretzman and McKnight, Building Communities from the Inside Out, 352. Van Eymeren, “Building Communities of the Kingdom,” 69. Kretzman and McKnight, Building Communities from the Inside Out, 354. Over the next few weeks I’d like to share with you an article I have written on the importance of Asset Based Community Development and Relational Thinking in relation to strengthening individuals in the context of working with marginalised communities. I wonder how do you see the people that you work with? What are the views you hold of the communities that you seek to change? As you reflect on your answers to these questions, a challenge for us in the thrust and parry of the everyday of caring community work, is to remember that each person we come across, whether an old friend, work colleague or a new connection from the street has inherent worth, because they are a loved creation of our creative God. Each one is made in His image and innately reflects something of the divine (Ps8:4-9). However for some, this spark of gold is hidden under layers of hurt, rejection, pain and heartbreak. If we are to be true to the high value God bestows on humankind, we need a framework that will help us dig below the surface that elements such as emotional and existential pain present. Asset Based Community Development (ABCD) together with Relational Thinking (RT) establishes such a framework and provides for us a rationale and demonstrable methodology or set of principles for our community work. Through the exploration of community I will unpack the importance of local connections and how they unearth hidden strengths, opening the door for personal and community empowerment. This process will help to shape a theology of engagement that recognises God’s Kingdom is in the world and that he invites each one to play a part in its advancement. Think with me for a moment about your local community, either where you live or where your work is based. What are the elements that make up that community? Sometimes it’s hard to stop and analyse the waters that we swim in or the air we breathe. In each of our communities there will be elements that seek to meet the needs we have, whether they present as physical, emotional or spiritual. These include the business community, schools, medical care, friends and family, sporting clubs and other varieties, churches and the religious expressions of other faith communities, libraries, local government, social services, media outlets and so on. If these elements of the community are working well and in harmony, they form an interconnected web of relationships, structures and institutions, where people can gain a sense of belonging and support to discover and live out their place and purpose as contributors in the world. If you like, a safety net of relationships has been established which affords the individual the opportunity to explore more of their external and internal worlds. There may even be the opportunity to explore new abilities in this context. 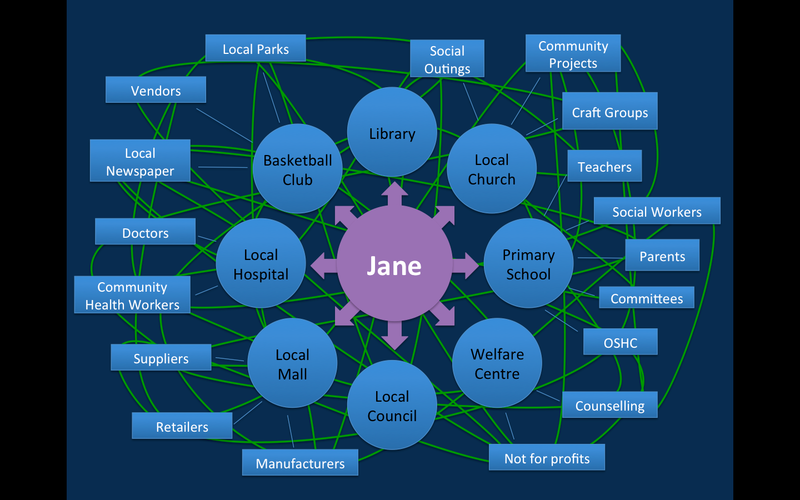 Figure 1 Jane’s Community. The ideal community recognises the individual placing them in a relational web, which provides for their physical, emotional and spiritual needs and those of their family. Unfortunately we know only too well that our communities aren’t like this and in fact the relational web that provides this safety is broken in so many places. The causes of this rupture are numerous including; individualism, consumerism, family breakdown, domestic violence, tall poppy syndrome, selfishness, addictions of various types and the list goes on. The results are equally as devastating both for individual psyches and communities more generally. Figure 2 Effects of the Broken Web. 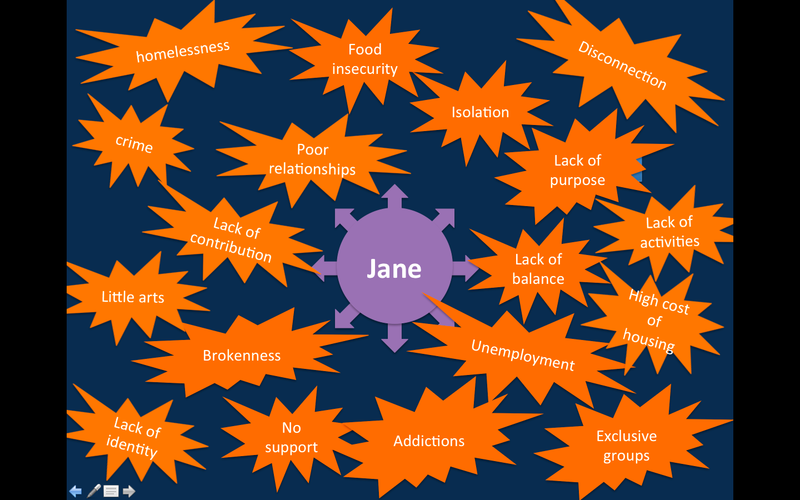 These are just a few of the results of a broken relational web, as we look at our communities the story is way too familiar. During the time I spent leading a missional community in Pakenham, on the South Eastern outskirts of Melbourne, I sat on the welfare committee of one of the local primary schools. Each Wednesday of the school term we gathered in the staffroom to work through solutions to some of the most concerning issues that the young students were facing. One morning we discussed the unfortunate divide present in many families and its effects on the children. Pakenham was a sleeper suburb with over 70% of the population leaving the community everyday to go to work. It was also one of the fastest growing suburbs in Australia. These two factors had a number of immediate implications. Firstly it meant that many parents spent long hours each week commuting up to 120km a day into the CBD. As well the time away from the community often led to the focus of the parent’s lives being elsewhere, even recreation could be removed from the place where there house was situated. On the other side of the equation the children were in the community. They lived their lives in the local community, were encouraged to become active in it, learnt about its history. In a sense made their ‘home’ in the community. We saw direct links between this disconnect and children ‘acting out.’ They couldn’t name it, yet the divided focus they were asked to live with and the confusion it caused was palpable. Even within a household the relational web can be broken leaving the members floating and feeling disconnected from each other and broader society. Some would argue if the basic building block of a community is broken, ie the household, is there any point looking to a more utopian hope for our communities. Sociologist Jim Ife believes that we must start there, as it provides inspiration and a framework for development that moves us from reaction to a focus on medium to long-term goals. From a Biblical perspective the prophet Isaiah outlines what a community could look like. He sees a place where; there is joy, the young and old are valued, each have what they need in terms of shelter and food, there is a strong connection between work and purpose, and the people recognise their dependence on God (Isaiah 65:17-25). The building block for this type of world is the local community. Asset Based Community Development is a methodology for community worked designed byJohn Kretzman and John McKnight. They have established the ABCD Institute that furthers this thinking around the world (http://www.abcdinstitute.org). Relational Thinking refers to the work of Michael Schluter, from a Kingdom of God viewpoint he has designed a framework of Relational Proximity which can be used as a guide to establishing life promoting relationships (http://www.jubilee-centre.org, http://relationalthinking.net). Working definition of a community, developed and taught by Andre Van Eymeren. Jim Ife, Community Development: Creating Community Alternatives – Vision, Analysis and Practice (Melbourne: Longman, 1995), 98.